Price is per long 34-inch strand of these beautiful beads. Each are slightly different size & shape, but largest average measures around 11mm x 7mm x 5mm. Amethyst is known as the Royal Purple Pope Stone, the purple variety of quartz. If it wasn’t so abundant, amethyst would be very expensive. Its name comes from the Greek, meaning not drunken. Perhaps due to a belief that amethyst would sober the effects of alcohol. Amethyst is always purple, but comes in shades of pale lilac to deep purple. Deeper colors are more valuable – milky amethyst is the cheapest. 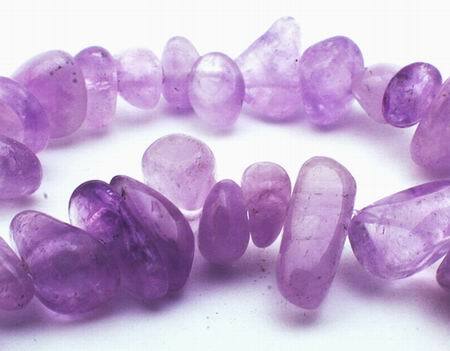 Amethyst is mined in South American, but the best in Africa. Very dark amethyst, mostly in small sizes, also comes from Australia. According to Greek mythology, Dionysus, the God of Intoxication was angered by an insult from a mere mortal and swore revenge on the next mortal that crossed his path, creating fierce tigers to carry out his wish. Along came unsuspecting Amethyst, a beautiful young maiden on her way to pay tribute to the goddess Diana. Diana turned Amethyst into a statue of pure crystalline quartz to protect her from the brutal claws. Dionysus wept tears of wine in remorse for his action at the sight of the beautiful statue. The god's tears stained the quartz purple, creating the gem we know today! Purple has long been considered a royal color, featured in the British Crown Jewels and a favorite of ancient Egyptian royalty. Leonardo Da Vinci wrote that “amethyst could dissipate evil thoughts and accelerate intelligence”. Because amethyst was believed to encourage celibacy and symbolize piety, it was very important in the ornamentation of churches in the middle ages. Amethyst is still the stone of bishops’ who often wear amethyst rings. Even in Tibet, amethyst is considered sacred to the Buddha. Amethyst’s sobering and calming qualities is why it’s considered to have the power to purify and bring peace. It’s also believed to boost lower energies higher, and heal at all levels of mind, body and spirit. Amethyst is especially useful to calm overworked minds as it brings mental strength, stability, and vigor, and reduces negativity. Amethyst also supports all that is transitional. Especially death and rebirth - providing peace of mind when a loved one is lost. As an elixir, amethyst can help toothache, bone and joint discomforts and problems with the stomach and digestion. It has also been known taken for blood disease and balance blood sugar. In yoga, amethyst aids the 6th Chakra, the Third Eye, center of the body’s spiritual power. Because amethyst heightens awareness, both spiritual and psychic - increasing intuition and psychic development and transition from a normal state of consciousness to a deeper awareness.